Around fifty years ago (in the 1960s) this was the view at the foot of Alder Street where it meets West 6th Avenue. There was a small wood-frame apartment building to the east, supposedly dating back to 1910, and across the street was more of the Vancouver Iron and Engineering Works (once the buildings of the Vancouver Machinery Depot Co whose president was George Walkem, a Conservative MLA in the early 1930s). Actually the apartment dated back to 1912, and was built at a cost of $50,000 by Arthur Langlois a carpenter who designed and built it for himself and three tenants. in 1913 they were Edward Dell (an engineer with the CPR), Harry Hunt (a compositor on the Province newspaper) and James Duke, (a draperies salesman). Arthur lived with his wife Elizabeth, daughters Mildred and Thelma (aged 9 and 7) and son Arthur jnr. Arthur was originally from Ontario and his wife was Scottish, but all their children had been born in British Columbia. Although the apartment building only received a building permit in 1912 and the Insurance map that year shows a vacant site, the 1911 census has the family living at that location so perhaps they were about to be living in a construction zone as Arthur replaced the house they had lived in for several years into a four-unit complex. Anybody living there today would be doing much the same; Alder Crossing, a 12 unit townhouse designed by Matthew Cheng Architect is just nearing completion. The view across the creek has changed a bit. Philadelphia Rosa Williams was probably born in 1832. She married a clergyman, Leigh Spencer, and they seem to have had five children. (Rev Spencer’s name was probably Oliph Leigh Spencer, but he was always recorded as Leigh). His family had founded All Souls College, Oxford, and there had been other members of the clergy over the years. Rosa Leigh Spencer, their daughter, was born in 1857 (or 1858) in Harpenden in Hertfordshire, England, and she had three older brothers including one called Oliph, born in 1852. Rosa’s father was the vicar of Renhold, Bedfordshire from 1859 to 1885. The family seems to have had additional financial resources as the Rev Spencer paid for the restoration of the church building. In 1881 the family who were living at home – her father, mother Philadelphia and sister Maude had three servants. (There were three sons not recorded as living at home). Her father died in 1886, and Miss Spencer found herself single, in her late twenties, and apparently comfortably off. She set off for Canada that year; it seems likely that she may have joined her brother. We are almost certain that the O L Spencer, barrister, who practiced in Vancouver from 1893 is Oliph Leigh Spencer. In 1891 he was in Ontario, although we have been unable to identify his sister in the census that year. 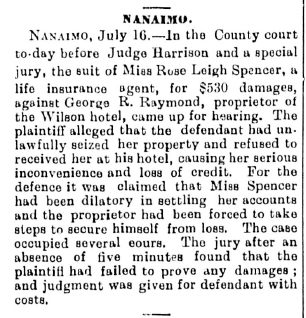 In 1894 however she was certainly in the province, if not in the city, as she had an unfortunate (and expensive) incident in Nanaimo (recorded on the left). In 1902 O L Spencer was elected as a Park Commissioner. Their mother was still in London in 1889, acting as exectutor to Charlotte Sophia Campbell, Baroness Craignish, who died that year at the same address that Philadelphia Spencer lived (3, Welbeck Mansions, Cadogan Terrace). She must have joined either her son or daughter some time later as Philadelphia Rosa Leigh Spencer died in Vancouver in 1902 aged 72. In 1901 R Leigh Spencer was recorded in the census, born in England, arrived in 1886, in real estate, living alone, aged 37. (Actually, she was 43). Her brother doesn’t seem to have been recorded. In 1900 Miss Spencer was involved in mining near Nelson. A Nelson Tribune article refers to Miss Spencer as ‘the only lady promoter in the province”. In 1902 she owned land in Cumberland, another mining district. 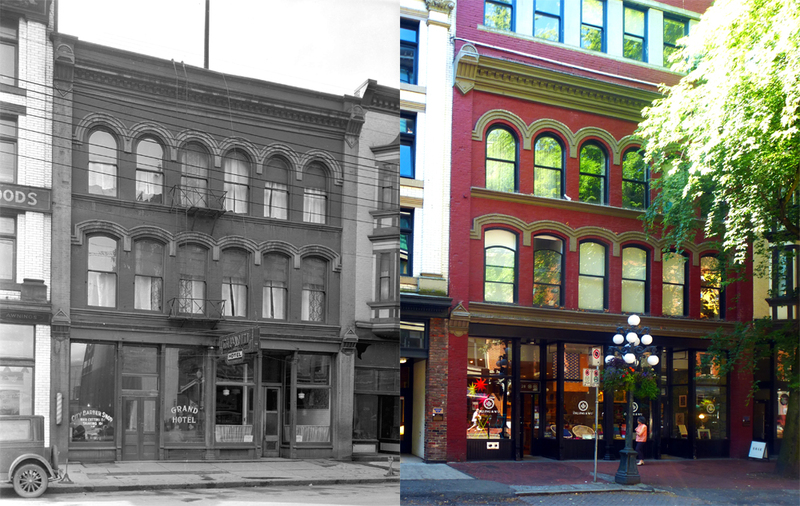 In 1901 we assume that the Miss L Spencer who built a $5,000 building designed by ‘Mr Grant’ on Granville Street was Rosa. The building was only 25 feet wide, and the pictures that exist for the early 1900s show a building which seems to have an unusual oval window on both the second and third floors. We’re assuming Mr Grant was G W Grant, a popular architect during this period. His design for the Ormidale Block (still standing on Hastings Street) a year earlier also features an oval window. 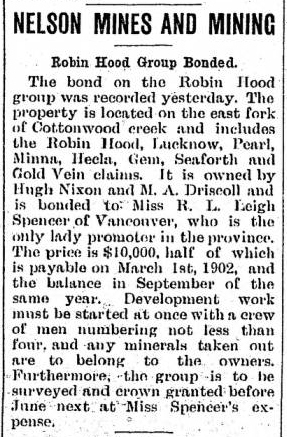 In 1904 O L Spencer was the secretary of the Vancouver Yacht Club, and then on the last day of 1905 the Times Colonist announced his sudden death from pneumonia while on a visit to San Francisco. This entirely unexpected turn of events appaently left his wife a widow. We have been able to confirm that this death, and therefore O L Spencer was almost certainly Rosa’s 54 year old brother, as the San Francisco funeral home registered the death of Oliph L Spencer in 1905. His wife was Annie (nee McDougall), and in 1884 Oliph Leigh Spencer was born in Toronto, so it appears he had at least one son (who died in Ganges on Saltspring Island in 1965), and two daughters, Dorothy and Vivian born in 1888 and 1889. In 1909 Miss Spencer decided to replace her eight year old 3-storey building with an 8-storey steel office, designed by E W Houghton of Seattle. That’s it closer to the camera, next door to the Bower Building (built a year or so earlier). Known as the Leigh Spencer building it took a year to fill, but by 1913 had a variety of tenants, the Lock Tie Brick Co Ltd, Acme Manicuring Parlors (on the fourth floor), several real estate offices, three barristers, Painter and Swales, the architects, the Vancouver Press Club on the seventh floor, and on the top floor “Leigh-Spencer, Miss”. George E Bower was born in Ontario, as was his wife Julia. He first appears in the 1892 Street Directory, as a salesman for Mr Winch. R V Winch was a fruit and fish merchant on Cordova, with a house on Oppenheimer. He and Mr Bower were both said to be from Cobourg, Ontario, and R V Winch had a sister, Julia, who married George. 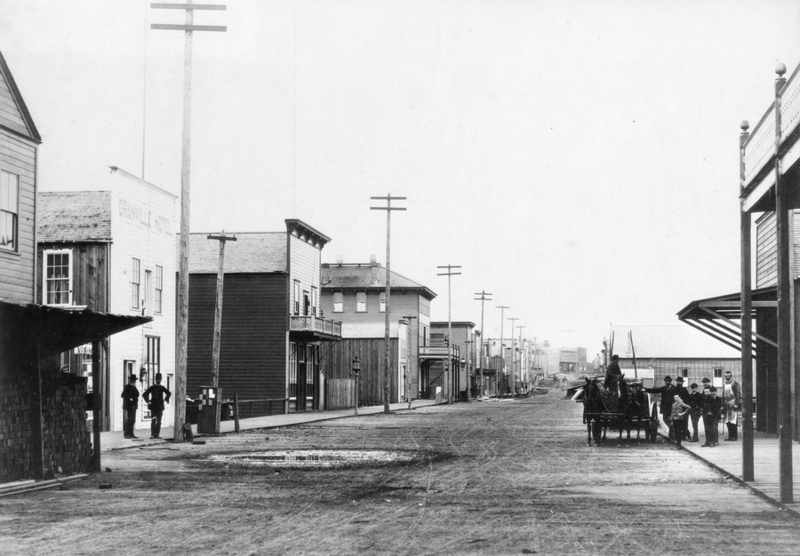 In 1894 George Bower was a partner in the Cordova store, and a home on a different block of Oppenheimer. In 1901 the Bower family of five were living on Barclay Street with their servant Sarrah Longcake. In 1911 the family had moved to Point Grey Road in a house built at a cost of $15,000 the year before, with their daughter Kathleen (who was aged 22 and had been awarded an MA degree), their 19-year-old son George and younger daughter Edith (aged 13). There was also a domestic servant, Kwong, aged 30. George was aged 53 and listed as retired. In 1909 George had commissioned Hooper and Watkins to design an 8-storey steel frame office building on Granville Street. George may have been retired, but he continued to make alterations to buildings he owned on Granville Street past 1920, and continued to live in his Point Grey home until 1935. Our VPL image shows the Bower Building – the tall building with the square windows closer to the camera, in 1941. Today there’s another office building on the site, still called the Bower Building but now 14 storeys, designed by Eng + Wright in 1995. Fire Hall #1 was designed by W T Whiteway on East Cordova Street in 1905, replacing a grocery store. Here it is a year later in a VPL image. A new hall was built nearby on Main Street in 1974, and in 1982 the Firehall Arts Centre opened in the decommissioned building. At least, that’s the official version, and while not in any way incorrect, it’s slightly misleading – it wasn’t the first fire station in the city. The first fire Fire Hall #1 was located on Water Street – there was a hose tower, and Engine House with sleeping hall above, and a hose house and gymnasium, all to the west of the Alhambra Hotel where the 1930 Nagle Brothers Garage was later built, and more recently converted to a retail and condo structure. 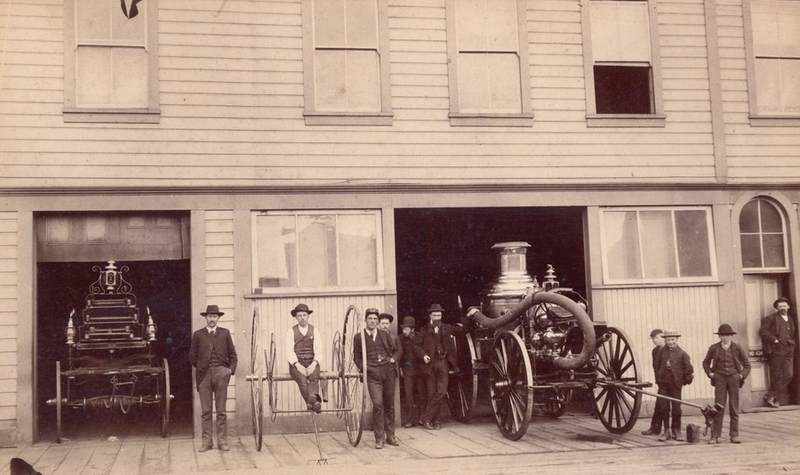 Firehall #1 today is on Heatley Avenue – to the left are Vancouver’s early fire fighters in 1895.